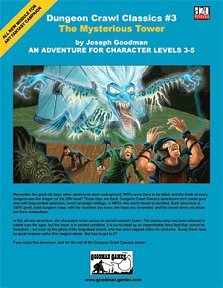 Now here's a thing: like any red-blooded adventuring party the prospect of raiding a long-deserted wizard's tower with an eye to looting it sounds like a good way to spend a day or two... but what if you cannot find the way in? You see, this is the first challenge that presents itself, gaining entry. It's part of what gets the characters there in the first place: the area is rife with rumours about a wizard's tower that not only has no discernable entrance, it's also protected by a forcefield, and appears in perfect condition although buildings around it stand in ruins. There must be something worth looting in there. Several hooks are provided to help you persuade the party to visit. There's some background explaining who built the tower and why it's ended up like this, which may become relevant if the party is interested in figuring such things out rather than just robbing the place... although it does explai why the place is haunted, and serves as a reminder to all spell-casters that prior preparation and planning are vital when engaged in major magic use! The adventure starts off combat-heavy, and also includes a trap-infested stage, with curious magic and puzzles to figure out once the party reach the tower itself. Maps are clear, and each location is given a three-part listing: description, creatures, and how they will react to the party. Monster stats and loot are also included, just where you'll need them. There are a full three levels of classic dungeon delve before the party reaches the tower proper, once within it's time to role-play, puzzle and think their way through to the end. Along the way there's a fascinating insight into the life of a studious and experimental wizard, the side of magic little touched on in games where most magic-users are just that: users of standard spells as a means to an end. It all makes for an entertaining classic adventure that is well thought out, challenging and coherent. Return to The Mysterious Tower page.